This one’s for the people that scan their drawings and trace it by hand in the digital domain. For when an iPad Pro or Wacom tablet is just too much money. The Slate by iskn looks like a traditional A5-sized drawing pad that you clip your favorite paper on within the pad’s drawing area. You then use a little ring that you put around your favorite pen or pencil (or use the presupplied pen) which will track every movement of your drawing tool into the digital domain. The Slate, and the Magic Happens from iskn on Vimeo. It looks like magic and it almost is. The pad has 32 sensors that are able to determine your pencils position (through the attached ring) and will make a digital render. The render will in turn be shown in the companion drawing app or in your favorite drawing software (through the graphic tablet configurator app). And if you don’t have any supported device with you there’s 8 GB memory on board of the Slate to cover for any masterpiece you create in the meanwhile. 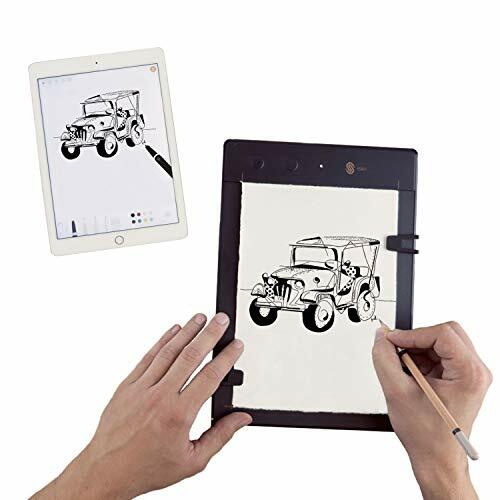 You can wire the Slate with USB or use the Bluetooth mode to wirelessly digitalise your drawings. The Slate also has dedicated buttons for creating new pages or layers in your projects. And the price. The price is something I didn’t expect for a device capable of rendering with this amount of detail.